San Clemente view: your romantic apartement in Rome! 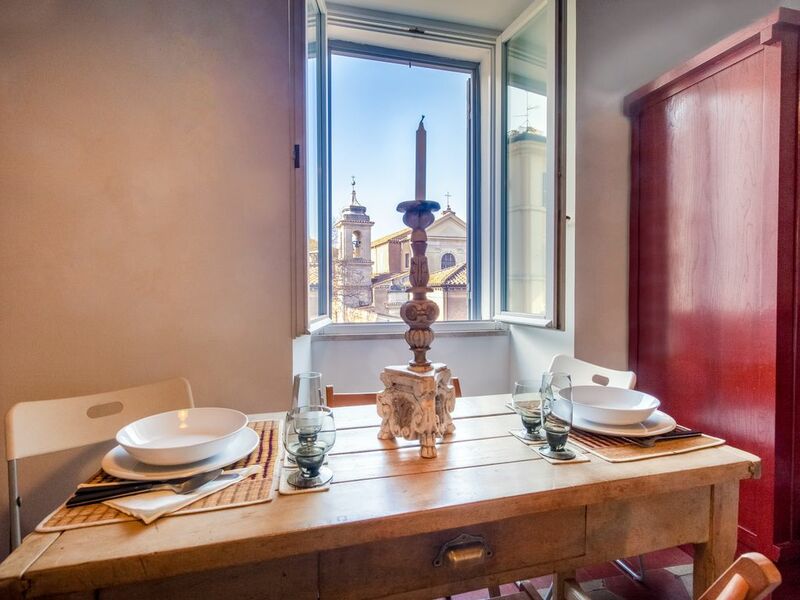 This charming and cosy apartment is located in the most exclusive Rome historical centre, in a perfect location to visit Rome major touristic sites: the Colosseum, Nerone's Domus Aurea, the Basilica of S. Clemente, the Roman Forum. The view that you can enjoy from its windows is really special!! It is a comfortable flat for two to four people or for one or two couples of friends: there is a lovely sitting room with a fully equipped kitchen in a corner and a double sofa bed plus a charming double bedroom in the second room, a very modern bathroom with a comfortable shower, free WIFI connection . It's air conditioned in all rooms, the ceiling is made of original wood recently restored and the floor in unique terracotta. It was completely renovated in 2014. The furniture is in warm and pleasant colours, the appliances are all brand new. It's child friendly. I started this vacation apartment rental business few years ago just for fun. Now, ten years later, I manage several properties, the majority of which are nearby the heart of Rome. My flats for rent are, with no exception, in pristine conditions. I visit all of them on a regular basis, to ensure my guests will receive the highest level of hospitality and the attention to every single detail. I am proud to say that I always strive to personally answer to all the emails I receive from future and past customers and take every question or request very seriously. I look forward to seeing you here in Rome, the Eternal City. Because it is centrally located, full of charme and newly furnished.. Restaurants: "Luzi" in Via Celimontana, "Quattro e quattr'otto"and the pizzeria "I rioni" in Via dei Santi quattro, La taverna dei Quaranta in Via Claudia. I really enjoyed the time I spent at the San Giovanni apartment. Situated near the beautiful San Clemente Basilica, this apartment was exactly what I was looking for in order to make my stay memorable. The apartment was close to the Colosseo but far enough away to feel secure. The neighborhood is filled with restaurants and little shops and friendly people. It is close enough to catch a taxi or hop on public transportation. The apartment has a cozy feel and it was a wonderful experience to open the windows and listen to the sounds of the city while enjoying a cup of coffee. It very much felt like my home away from home. I am looking forward to my next stay. This apartment is exactly as advertised. Its location, in a quiet building close to Rome's many iconic sights, makes it an efficient home base. It suited our needs for the four nights perfectly. Thank you. Charming apartment well situated in Rome. The apartment is small but very comfortable. Beautiful wooden ceilings and a great view out of the working windows onto San Clemente Church. Very conveniently located for the Coloseum and not too far to the Metro stop. I would definitely recommend. Alessandra was a perfect host, giving us all the information we required for our 3 night stay. She met us as agreed at the apartment, full of info and offered to be available if needed. The apartment is perfect for a couple and was adequate in size for family of 3 like us. Location could not be any better for the Colesseum and surrounding areas. Shops, cafe’s, restaurants and bars a plenty in the nearing streets. The apartment was clean and well presented with most amenaties, just missing a washing machine if you need one. Thank you Alessandra, we thoroughly enjoyed our stay. What a great place! I was blown away by how close it was to the Colosseum!! Alessandra was an excellent communicator and always responded quickly and with all my questions answered. The flat was absolutely perfect. The location was amazing, the amenities were just what we needed and the bed was very cozy! After a long day of walking around, it was a bonus to walk into a cool apartment. I would highly recommend staying in this location and would do so again if I come back to Rome! Thank you for being so accommodating, Alessandra! What really stands out about this apartment is the location and the affordability. The colosseum is down the street, and many other attractions are within walking distance. The apartment itself is rather empty, and could use some more wall decorations. However, the bed is comfortable and everything in the apartment works well. Having the air conditioning on a hot summer day is essential, and the wall units here work very well to circulate cool air around the entire apartment. I would definitely stay here again on another visit. Metro station walking distance. Bus 50 m. Bars, restaurants, pizzerias rownd the corner. Restaurants like Luzi, le Naumachie or I Rioni are rownd the corner in via Celimontana, special also the roman food of the Taverna dei Quaranta in Via Claudia withy pergola and view of the Colosseo.The Bar antiluzi,100 m form the apartment "cappuccino and cornetto" in the sun in small tables along the street, you cannot miss it! Shopping in the street and nearby: Italian fashion, food, handicraft. Late arrival check in : 25 euro after 20h, 50 euro after 24h. Si vous arrivez après 20 h supplement de 25 euro pour check in le soir, après 24h 50 euro. Une taxe de sejour de 3.50 par jour par personne viendra payé le jour de votre arrivée à Rome au moment du check in. A city tax of 3.50 per day per person will be paid in cash to the person that will check you in on the day of your arrival.